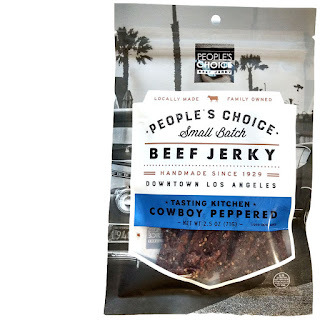 People's Choice Beef Jerky recently introduced a new flavor, "Cowboy Peppered". It launched in October 2017. 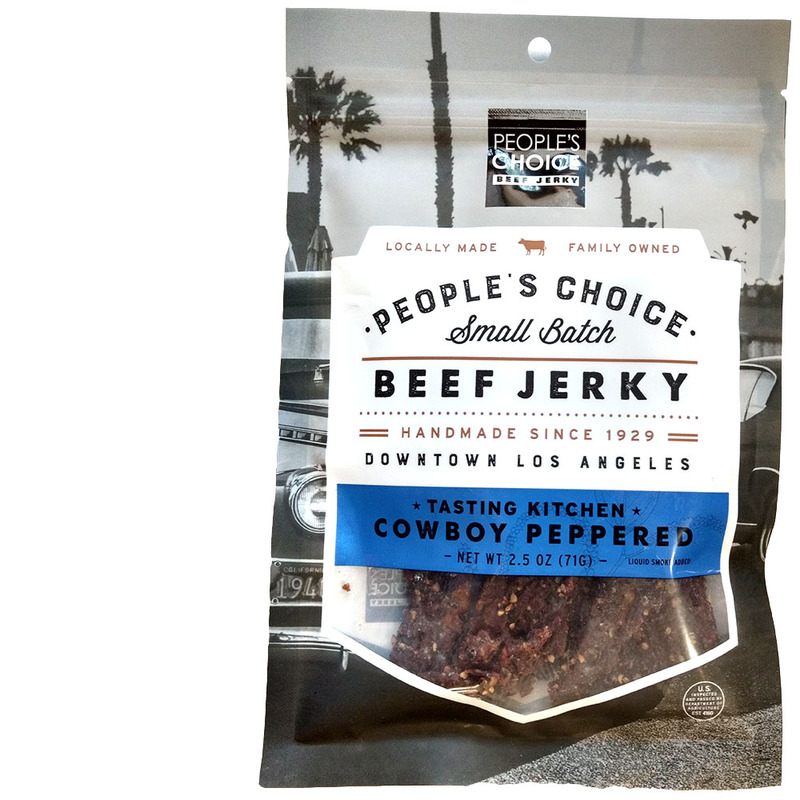 People's Choice Beef Jerky is a brand of People's Sausage Company, Inc. based out of Los Angeles, CA. It's a family-run business that's been around since 1929. 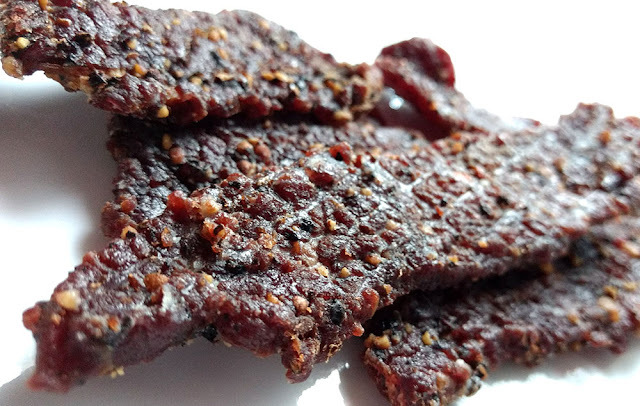 This new Cowboy Peppered variety is part of the company's "Tasting Kitchen" series, which is a line of jerky that mixes bold, eclectic ingredients, with the old fashioned style of making jerky. The company says this Cowboy Peppered is, "...for those that love the rich and bold flavor of coarse black pepper ... married with slight sweetness of sugar and the richness of Worcestershire sauce." The first flavors that come into view is a noticeable sweet, followed by a light black pepper. There's a pan-fried steak flavor that comes in too. The chewing brings on more of the steak flavor, while the black pepper ramps up a bit more. The worcestershire remains light. For being called, "Cowboy Peppered", and further marketed as "rich and bold flavor of coarse black pepper", this delivers well. I get a very rich black pepper flavor, tasting freshly cracked. It's pungent, sharp, and spicy, and rates as "medium" (level 3 out of 5) on our heat scale. The "cowboy" part of the name is quite fitting too, because this jerky has a more old fashioned character in terms of both flavor and chewing. It's more chewy, more steak-like. The primary taste profile could be described as a sweetened, pan-fried steak flavor with a strong black pepper presence. The sweet is well pronounced in this and takes up a lead role. Yet, the black pepper is equal to the task towards maintaining balance. But the pan-fried steak, along with its bursts of fatty flavor, helps marry the two. The meat consistency is great. It's a dry chew, somewhat crumbly at start, even lightly crunchy, but eventually takes on a meaty, steak-like chew. Some pieces, however, were rather crumbly throughout. These pieces tend to require more effort to chew through, but overall not too bad. Some have bits of fatty deposits which actually contribute to the pan-fried steak flavor. This new Cowboy Peppered variety from People's Choice Beef Jerky will certainly put some business in your "git up and go" and maybe a little pucker in your posterior, thanks the to rich, bold, and sharp character of freshly cracked black pepper. I love the fatty, marbleized flavor these strips of dried steak impart to the palate, and I love the lightly crunchy, yet steak-like chewing texture. But, the spicy black pepper makes a strong showing, enough to register on tongues worn out over weeks of cattle drives and campfire coffee. You will get a fair amount of sweet, just in case any hipsters tag along. But be warned! This is a manly jerky intended for hombres with split lips and calloused fingers.